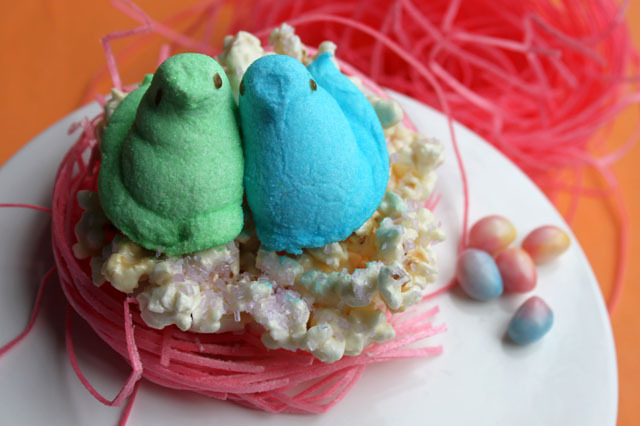 Awww, two sparkly bird bellies nuzzled atop a buttery mallow nest; Easter candy is the cutest. 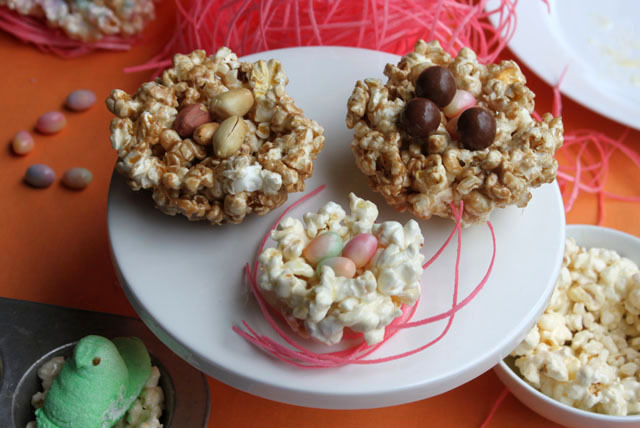 I opted out of the traditional coconut nests this year and modified the form of my simple popcorn ball recipe to make fluffier nests for my Peeps. Shredded wheat and coconut cannot be easy on those soft chickymallow bums. For the caramel-colored ones, I used the same recipe, except I scorched the butter till golden before melting in the mini-mallows: especially tasty with Whoppers and roasted peanuts. 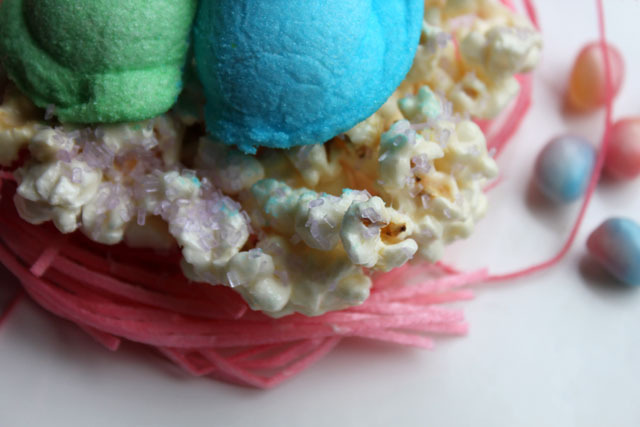 The decorated nests slide easily into cellophane bags filled with edible Easter grass and make for bright and sugary Spring-colored favors or small gifts for giving. Assembly can also be an easy interactive treat-craft activity for all ages. Prepare the popcorn nests in advance and store them in an airtight container (or simply mold them into muffin tins and cover). When it’s time for the fun, set out supply bowls of jelly beans, nuts, sprinkles, chocolates, Peeps, or whatever works with your company’s aesthetic and dietary needs/desires. Each person begins with an empty nest and fills it up with whatever it takes to make a sweet, treat-filled home. It turns out that I like sour jellybeans in my popcorn nest! This is too cute…definitely doing this. These little birds are so cute they really made me smile. ps if you want to see some of my artwork I have just done a post about it. Number one: And I quote, “Shredded wheat and coconut cannot be easy on those soft chickymallow bums.” This sent me into a gigglefest that more than likely was not induced by coffee. gigglefest 🙂 I must empathize well with sweet confections. I really think that anyone can put these nests together, and might I say, nice and tasty! I bought the edible Easter grass at Fresh Market, and I’ve seen it at World Market. http://www.orientaltrading.com/edible-easter-grass-a2-37_108.fltr I bet Meijer or Aldi have it too, since it is made in Germany. I hope the kids have fun! 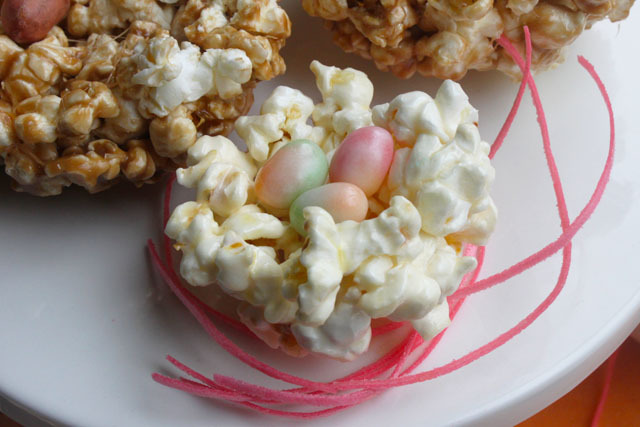 I love that you modified the popcorn ball and thought of your Peeps comfort. 🙂 They look delicious and so much fun. 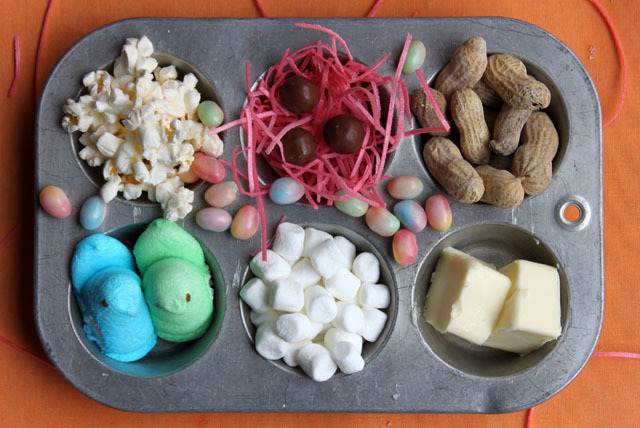 The “nest” is a great idea with all the Easter egg candies. thanks! I think the flavors meld nicely 🙂 and the Peeps seemed happy. I just thought of a way not to have to wait a WHOLE ENTIRE YEAR to try this: I think I saw Halloween Peeps in the shape of owls last fall. Maybe they’d like a cozy popcorn nest, too? Oh my! What a great idea! I wish I’d seen this before Easter. I actually made nest inspired cupcakes, but these are way cuter.